The The Never-Bored Kid Book, Ages 6-7 is on sale for $4.99 at Amazon right now. That's 50% off the list price of $9.99! A great way to keep the kids busy over the holiday breaks but keep them learning! While being engaged in fun activities, your children will be practicing important age-appropriate skills such as visual discrimination, sequencing, small muscle coordination, counting, reading, and critical and creative thinking. The activities in TheNever-Bored Kid Book, Ages 6 and 7 are organized around 16 age-appropriate themes, including: monkeys dogs insects Blast Off into Space birds The Tortoise and the Hare kangaroos Old MacDonald Fish clowns bears elephant octopus and spider frogs the firehouse chickens. 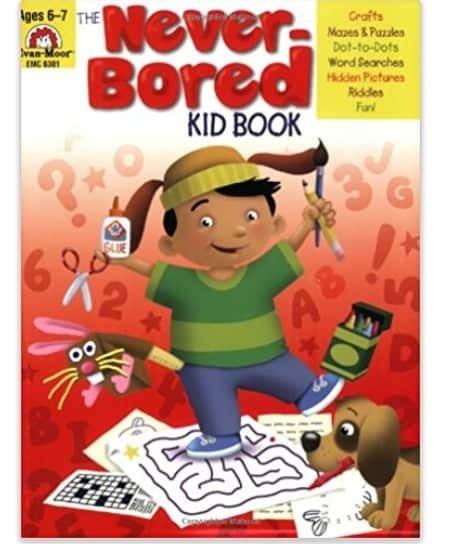 You can also get the The Never-Bored Kid Book, Ages 4-5 for only $4.99!